Solar Eclipse 2017 - How to Shoot? Luminous Landscape Forum > Equipment & Techniques > Cameras, Lenses and Shooting gear > Solar Eclipse 2017 - How to Shoot? What is the current thinking about photographing the eclipse? For instance, is a 10-stop ND filter good enough protection for the sensor (or eyes)? Re: Solar Eclipse 2017 - How to Shoot? Direct viewing of the sun before and after totality should only be performed through CERTIFIED eclipse glasses. If your eclipse glasses or viewers are compliant with the ISO 12312-2 safety standard, you may look at the uneclipsed or partially eclipsed Sun through them for as long as you wish. 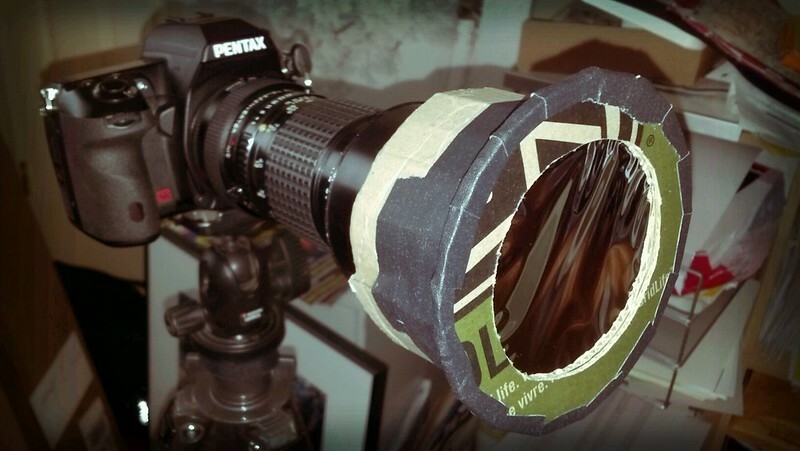 You do NOT want to rely on your "Big Stopper" for a direct view. You do NOT want to leave your camera on "live view" to monitor a magnified sun image for long periods either. Think you need at least 15 stops, and more is better. Dangerous because looking through the camera of a dSLR with can damage your eyes except during the period of totality of you are in that path of the full eclipse. We’ve been selling solar filters here, and they are designed for a camera, not a human eye, so even using one of those to “look” at the eclipse can be dangerous. During totality, removing the filter is normal. I’ve been told the solar filters are more than just density, somewhat wavelength restrictive as well. Looking through one is denser than two big stoppers stacked. In the past I have used a 10 stop filter stacked with a polarizer. Worked well enough and I didn't care that there wasn't detail on the solar disk. For the Venus Passage, I got some Baader soloar filter film and created a crude looking filter for my intended lens with cardboard. 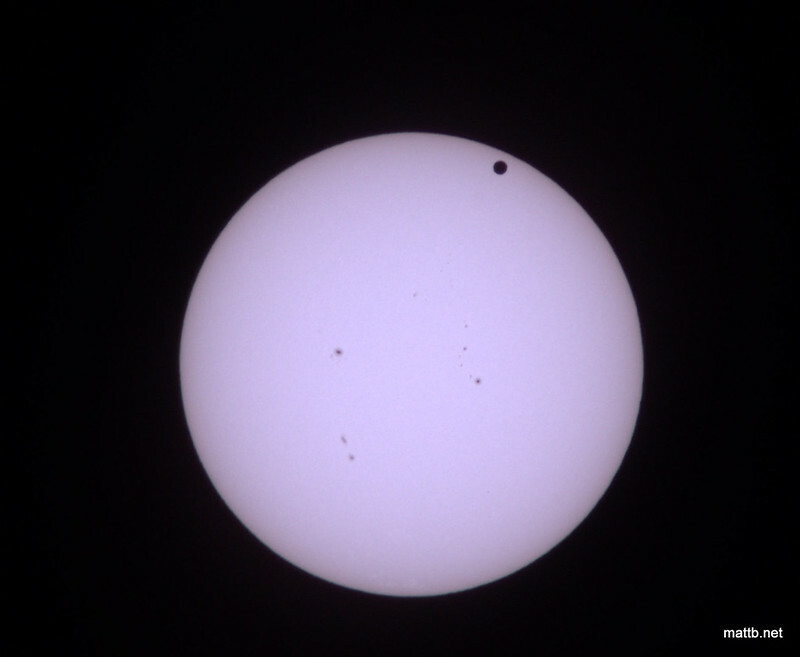 That got me detail on the solar disk including some sunspots in addition to Venus. Of course you can buy nicer versions of this too but mine seemed to work well enough for my needs. Baader AstroSolar is the product I got from eBay. Use Live View instead of the viewfinder. Easier with the filter in place and safer for your eyes! I have the ISOwhatever certified eclipse glasses, plus DIY filters. The DIY filters are cardboard-framed Baader Solar film special mylar - usable/affordable for people with big lenses, big refractor or reflector telescopes. $25.00 for one A4 size, does your big white or refractor, plus some left over for binoculars. These aren't the sturdiest option (I am punching holes in the home-made holders for tie-down strings), but these should do fine. Mine looks like Matt's but in white cardboard. That's a fun transit, Matt! You are 100% correct, Live View is your friend. What is important for eyesight is that the ISO certified eclipse glasses have extra infrared and UV coverage vs your basic Big Stoppers. Your cameras have IR/UV cut filters already covering their sensors, your eyes don't. Not me! I will take a nice day off and hang out at a local conservation area, two cameras, two tripods in hand. Start those batteries charging....now. So, for full frame camera in portrait mode, the 21 mm ought to give me plenty of composition (82 degrees view long axis, 60 degrees short axis) - I just need some attractive prairie flowers or a nicely shaped tree as the anchor in the composition. I am not looking for "spectacular", I am looking for "region-characteristic". Plus, there's the 400mm plus 1.4x TC option for the APS-C camera for my very own corona shots during totality. I considered flying to Portland (OR) to hang out with my friend K in the totality zone, but then I got lazy and decided instead to hang out with another friend at our fav local park ~30 miles away. In fact I've just come back from scouting out good viewing locations. Haven't yet decided on gear, though it'll likely be the Panasonic 100–400mm mounted on my GX8 + mylar solar filter latched onto the lens hood. Maybe a second cam with a wide lens too. I considered visiting some friends too but I have a big trip coming up and just don't have the resources to pull it all off. Eclipses are neat and I like to shoot them but I feel like my shot options are limited and there are tons of the same shot being taken so I don't need to put a whole lot of effort into it. 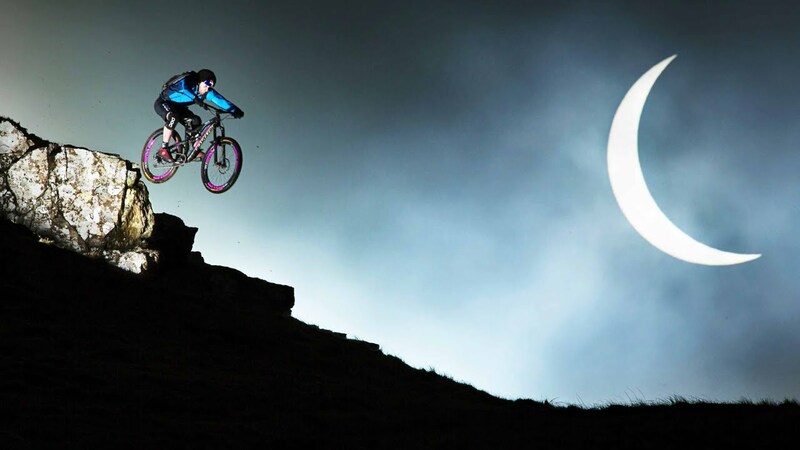 Maybe I'm just being too narrow minded and should come up with something to top this Rutger Pauw shot with Danny MacAskill. Shoulda mentioned that my most important gear in this case is my set of solar glasses! Direct observation is IMO by far the best part of the whole experience. Here is a long and detailed "how to" on Michael Fyre's blog. Hope it helps. FWIW, here's a quick test shot from a short time ago during a brief sunny-ish interlude. It's been partly/mostly cloudy today, as has been the case for much of this summer. The forecast for next Monday is, however, sunny. Hope so! GX8, 300/6.3 mirror lens, tripod, slip-on solar filter, ISO 200 (native), 1/4 sec. exposure, daylight color balance. Full-res crop from 20mp file, quick rather than careful focus. Think I'll use this tiny mirror lens rather than the big-ish zoom. Also think I'll just snap a handful of pics at the beginning of occultation, a handful at around halfway, then a third handful at full occultation (about 90% in my locale). Otherwise we'll be looking via solar glasses and enjoying the day. Backpack, hiking poles, headlamp and flashlight, possibly an umbrella or rainfly (shade), batteries batteries batteries (AA, AAA, camera), clothing, hat, sunscreen, water, more water, (ahem...), bug spray, first aid kit, half a dozen clif bars, folding stool, gaff tape, and then of course the ECLIPSE GLASSES, solar filter, 2 tripods, 2 cameras, 400mm and 21 mm and 14 mm lenses, several wired shutter releases, etc plus the cheat sheet reminding me what I need to do when. What I don't know is whether I will have access to desired sites. So, I have 5 sites (well known to me) in mind, I will take the first site with an open parking spot. Start off at 3 AM. More careful approach + no clouds = better result. Some tiny sunspots too! The sun's location in the sky during the eclipse suggests I could do fine photographically from my backyard, weather permitting. I did need to yank the bejeezus out of this pic in post to get decent contrast. Since it looks like I'll be at home during the eclipse, I figured I'd give my Panasonic 100–400mm zoom a test run. Turned out pretty well, I think, so I'll use it on Monday. GX8 camera, 400mm, tripod, ISO 800, f/7.1, 1/200th sec., mylar solar filter, tungsten white balance (~2800K). Used autofocus (at the sun/sky boundary) and took 6–7 shots once I dialed in all the other parameters. The filter I'm using seems pretty strong relative to other test shots I've seen on the 'nets (it's rated for direct visual use too). I have nothing to show you guys even know I was in Madras and had a camera on the tripod. I decided to watch it unfold in the environment I was in. I did have a great pair of binoculars to observe the totality though.